A reader (Thank you, reader) just wrote in to inform me that at her store (local to me) the Rejuvenate Hoodies had been restickered to $98 tonight. I called another local store to confirm and although the tags had not been restickered yet at that store, it was ringing in at $98. Black Camouflage Wunder Under Crops Spotted! 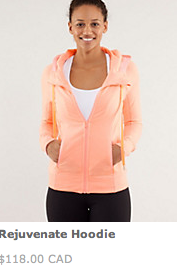 "The Latest: Surf To Studio Jacket, Surya Tank, Heat It Up Crop, Rejuvenate Hoodie and More"